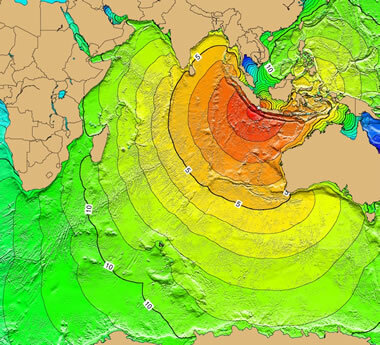 Maps composed by NOAA using Tsunami Travel Time Software. The explosion of the Krakatau Volcano in Indonesia on August 27, 1883, generated a 30-meter tsunami in the Sunda Strait which killed about 36,000 people. It also caused an atmospheric pressure wave that was recorded on the tide gauges at remote locations including South Georgia Island, Panama, France, England, Alaska, Hawaii, and San Francisco. Due to the shadowing by continents and island groups, a direct tsunami could not have reached most of these locations. Atmospheric gravity waves occurred which may have excited water waves by transferring energy into the ocean. It was recorded with an amplitude of six inches at Sausalito, California. NOAA image. View larger map. Some of the world's most deadly tsunamis have been produced around the rim of the Indian Ocean. 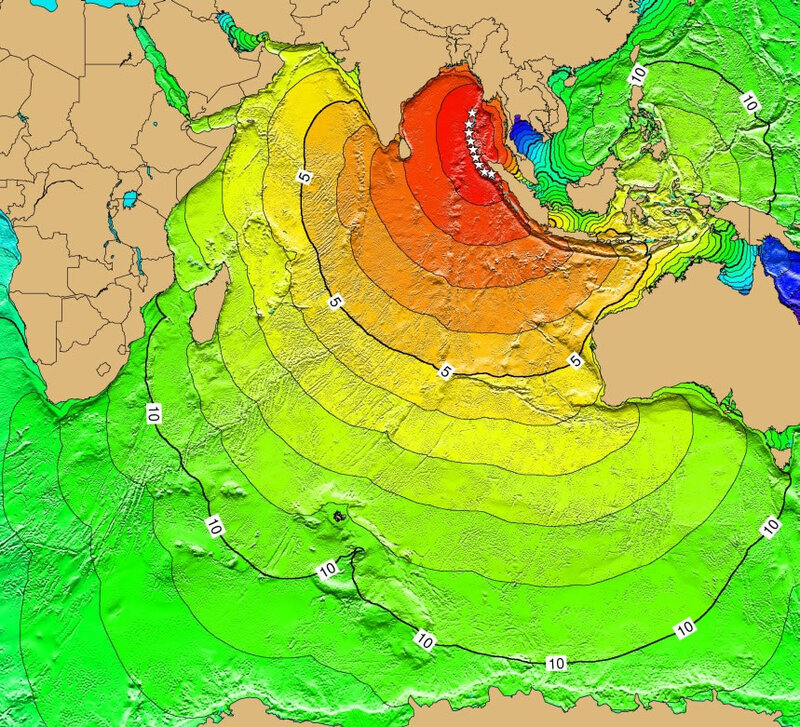 The December 26, 2004 tsunami that killed over 250,000 people was produced by a subduction zone earthquake on the west coast of Sumatra, Indonesia. On August 27, 1883 a blast at Krakatau Volcano in the Sunda Straight of Indonesia produced a tsunami that killed about 36,000 people. The maps on this page show approximate travel times for each of these tsunamis. 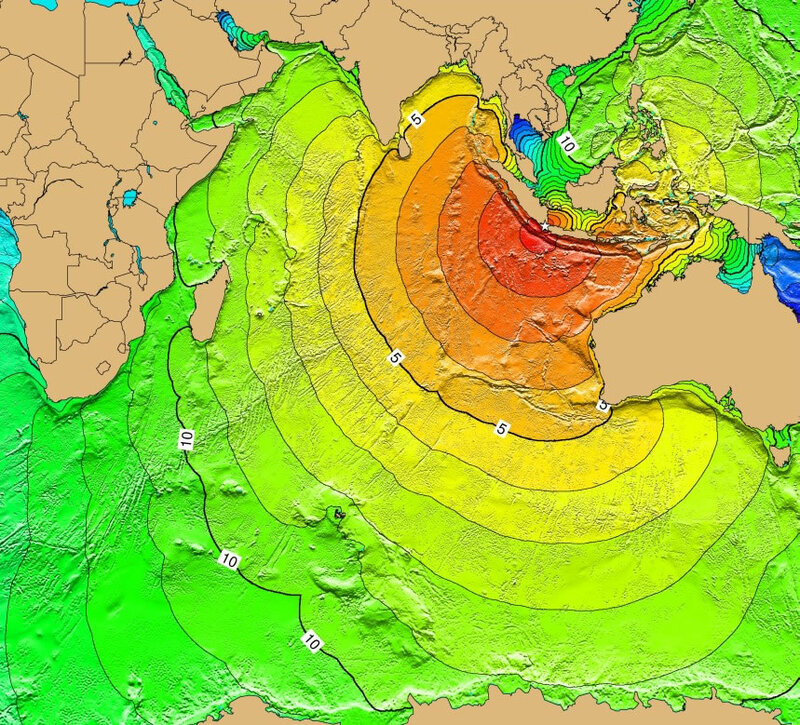 A magnitude 9.4 Mw earthquake occurred off the west coast of Sumatra, Indonesia, on December 26, 2004. It was the fourth-largest earthquake in the world since 1900 and the largest since the 1964 Prince William Sound, Alaska, earthquake. The earthquake generated a tsunami that caused more casualties than any other in recorded history. 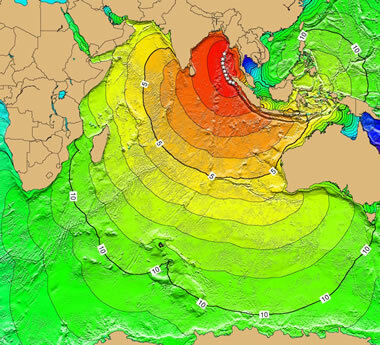 The tsunami was recorded nearly world-wide on tide gauges in the Indian, Pacific and Atlantic Oceans. In total, more than 283,100 people were killed, 14,1000 are still listed as missing and 1,126,900 were displaced by the earthquake and subsequent tsunami in 10 countries in South Asia and East Africa. NOAA image. View larger map.